It really is kind of creepy that it’s the wackos who may have come up with the best traction in the effort to demand some accountability and honesty from the administration in the drone fiasco. But it it takes a “hold” threat from a Tea Party senator to shake the OLC memos out, I guess that’s American Democracy in Action, such as it is, eh? None of Senator Paul’s questions seem all that unreasonable on their face. There ought to be answers to them, and the answers should be readily available. Except maybe the one to Brennan which asks what his “role” was in the killing of al-Awlaki’s son — I’ll bet Mr. Brennan still appreciates the Fifth Amendment’s privilege against self-incrimination and if that’s how he would be advised to respond, so be it. The questions about the potential role of drone killings in the U.S. are by no means folly, either. It was, in fact, maybe a little unnervingly notable that Obama chose to use the term “Americans” (not “America” or “U.S.” or even “American interests”) in his SOTU mention of what drones are being used to protect. That’s not what the text of the AUMF provides; does somebody believe the chimerical “Article II” construct can nullify all US laws if a presidential edict believes there’s somebody in the US who may be intent upon “imminently harming” an American here? If the answer to that is “no way”, could we please get that in writing? Nice to see you getting credit for the work you do. Rock on. I’d say Paul is asking the questions the Village is too insulated and ignorant to ask. Great post. This drone assassination campaign is a frightening expansion of unchecked Presidential power. And it parallels arguments I made when I was first sworn into Congress in 2005 about the lack of oversight about some of the most troubling provisions of the Patriot Act. Then, as now, the White House invoked words and ideals like national security in an attempt to justify this troubling unilateral expansion of Presidential powers. President Bush was wrong then. President Obama is wrong now. Read the whole piece, it’s a remarkable bit of clear thinking and nothing like I ever remember seeing from Mack during the Senate campaign or his time in the House. @Bitter Angry Drunk: Maybe more disinclined to rock the boat, or scared that doing so would impede the continued flow of Federal largess. OTOH, it’s never a good idea to discount insulation and ignorance. … and in the end there was nobody left to call for help when they came for me. I bet he doesn’t. Sees himself as above the law, a death-deciding god, not a citizen, and that’s exactly what he told the committee. MARCY WHEELER: …in addition to asking for these OLC memos, Ron Wyden, senator from Oregon, has also said, “You know, I’ve been” – he said to Brennan – “I’ve been asking for a year for a list of other countries in which we use these counterterrorism lethal force – in which we have used, or in which I think” – I’d have to look at the language again – or “in which we are authorized – you are operating with these counterterrorist lethal force.” And he hasn’t gotten that either. So Ron Wyden, a member of the Intelligence Committee, doesn’t even know which countries we’re at war with. That says, you know – and again, it’s this problem, like if Congress doesn’t know which countries we’re at war with, then it’s very hard to say that Congress has approved that war, and if Congress hasn’t approved it, then it would be a covert op, in which case the Intelligence Committee should have been briefed, but we know Ron Wyden hasn’t been briefed, so either way they’re in legal problem. MARCY WHEELER: Well, and that’s one of the funny things about – well, “funny” meaning it’s not humorous but it’s odd – is that for years now, and certainly since last May when there was a big PR campaign, the story has been that Obama has been the one making the decision – you know, however troubling it is that the president would choose to kill an American citizen, that’s not what the white paper says. The white paper says that a senior official – “an informed senior official” – we know that’s John Brennan. John Brennan was not elected. He’s not been confirmed by the Senate. He couldn’t be confirmed in 2009… And so we’ve got this guy who couldn’t be confirmed in 2009 because he was so closely tied to crime, making a decision on whether or not Americans should be killed. Is the dog not going to bark? Who chloroformed the dog and sent in mechanical wagging puppies? My thanks to Rand Paul for showing up. He might be whacked on other things (and definitely is) but the other thing about Rand Paul is that I believe he would be asking these questions of a Republican president too. He marches to his own drum and doesn’t say how high when the party asks him to jump. One of the few people in office who does not seem to put party over principle. He reminds me of Kucinich in certain ways. I wish more progressives would put party aside and get tough. Luckily the writers on this site always do but this is the exception to the rule. One of the authors of the Benghazi book mentioned in a comment on his site that Rand Paul came to them with some questions about Benghazi too, but they did not engage him. I take it they are trying to stay away from the political aspects of this. He was speaking of emancipation, but also of a larger topic, the ultimate survival of democracy. Still confused on the number of memos. Is the latest tally that there are 11 total memos and 7 still not released, so that would mean 4 have been given to Senate intel plus the white paper? I knew that 2 had been coughed up by the Obama admin, but when did they release the other two? Once again, the only truly reliable journalism show picks up truly reliable reporting — The Daily Show features emptywheel. I made the point that Marcy makes — sensible questions raised by Paul — in a comment yesterday on TPM, and further wondered whether the negative reaction I was seeing related to it being a democrat site. Actually, I wanted to test the knee jerk reflexive reactions of that bunch. They did not disappoint. The nicest think I was called was a troll . . . If you actually referred to it as a ‘democrat site’ you were deserving of some of that. It’s a Fox News dog whistle. It’s nice the village idiot is asking these questions but we all know if he had the power 0 has he would use it and may be even more so if that’s possible. The only reason he’s doing this is to be a thorn in 0 side and that works for me but to think any of the cycle-0-paths in govt. would give this new illegal power up well good luck with that thought. Great time line, many thanks. I also saw you over at Anti-War. Com the other day Marcy. 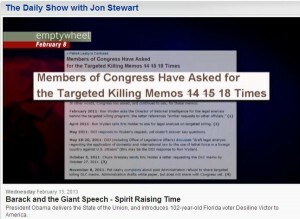 That graphic is from The Daily Show. I have tweeted them and sent an email suggesting that they invite Marcy on to discuss this stuff. You can too! The underlying absurdity of the administration’s position can be summarized this way. Once you get to a substantive compliance analysis for “cruel, inhuman, and degrading” you get the position that the substantive standard is the same as it is in analogous U.S. constitutional law. So the OLC must argue, in effect, that the methods and the conditions of confinement in the CIA program could constitutionally be inflicted on American citizens in a county jail. Of course, when Zelikow said that, the Bush administration disappeared his memo. At the time, in 2005, I circulated an opposing view of the legal reasoning. My bureaucratic position, as counselor to the secretary of state, didn’t entitle me to offer a legal opinion. But I felt obliged to put an alternative view in front of my colleagues at other agencies, warning them that other lawyers (and judges) might find the OLC views unsustainable. My colleagues were entitled to ignore my views. They did more than that: The White House attempted to collect and destroy all copies of my memo. You’d think words were powerful or something. I wonder, has anyone tried to deal with “terrorists” with… words? TPTB seem to be afraid that accused terrorists have Super Secret Powers and can convince people to agree with them just by speaking. It doesn’t say much for TPTB if they’re that afraid of them. @thatvisionthing: You’re right. I meant to suggest that, if asked about his role and there appeared to be the remotest possibility he might actually be held to account for that role, then he might “magically develop” a newfound respect for the privilege against self-incrimination. You know, on a “these rights are inconsequential unless they affect me” basis so popular in these days of selective application of the Constitution.